Working in concert with City of Hope (COH), a leading research and treatment center for cancer, diabetes and other life-threatening diseases near Los Angeles, California with clinics in Antelope Valley and South Pasadena, CHL Marketing Lab developed a comprehensive enterprise-wide strategy to reach the 48% Hispanic population in their surrounding service area. Designated as a comprehensive cancer center, the highest recognition bestowed by the National Cancer Institute, COH is also a founding member of the National Comprehensive Cancer Network, with research and treatment protocols that advance care throughout the nation. 2) The urgency is greater in this industry because the lack of research and outreach to the community directly affects their health and well-being. The need for a more diverse workforce in order to serve a more diverse population of patients is increasingly becoming a priority, and as a recent Wall Street Journal article pointed out, in the healthcare and insurance industries, the race is on to connect with, educate and recruit this increasingly influential group. On its website, the National Institutes of Health (NIH) "recognizes a unique and compelling need to promote diversity in the biomedical, behavioral, clinical, and social sciences research workforce." Designing an enterprise-wide Hispanic business model requires change management. CHL Marketing Lab worked collaboratively with COH’s executives, physicians and conducted in-depth research, marketplace analysis and integrated CHL’s cultural characteristics framework, findings and analytics to carefully identify the most comprehensive approach that would leverage COH’s existing brand, community and patient services assets. The Lab conducted numerous 1:1 interviews across all functional areas to identify existing best practices and areas for improvement. Additionally, COH sponsored the national college leadership tour and CHL’s leadership workshop program to support the furtherance of the Hispanic talent pipeline for both their workforce and graduate school recruitment needs. In support of the strategy, CHL Marketing Lab designed, led, organized and facilitated a thought-leadership healthcare forum where more than 100 distinguished panels, noted experts and leaders from around the country converged to support a “solutions-based” conversation around how to strengthen the Hispanic talent pipeline in the healthcare industry. This forum also featured an interactive “solutions-exchange” session that allowed participants to further discuss the healthcare industry leadership and resource requirements to solve for a list of “opportunity-statements” that were derived from our research. The Lab designed an online discussion forum to hold participants accountable to further expand the dialog within their spheres of influence. In an effort to bring all of the strategy components together, CHL Marketing Lab designed and developed a comprehensive online educational healthcare portal to feature COH’s physicians and researchers as thought-leaders. 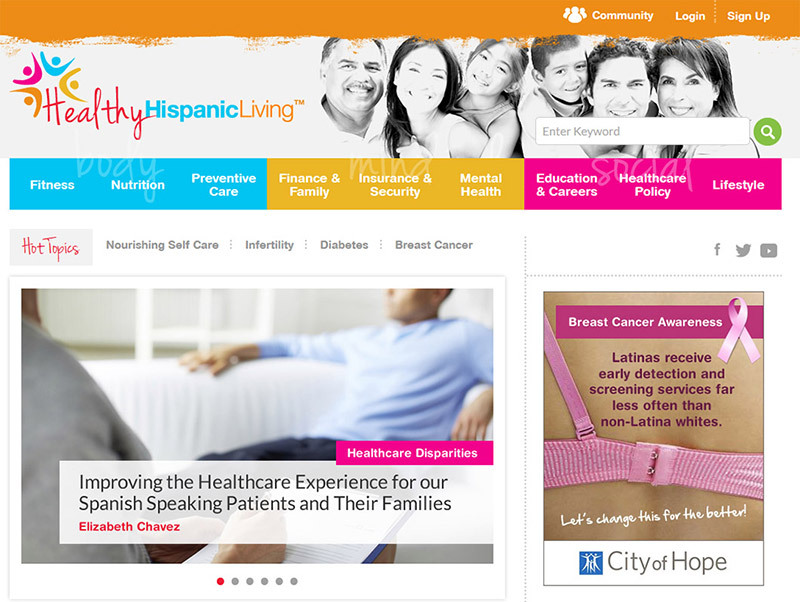 The portal, www.HealthyHispanicLiving.com, is a culturally-relevant content and communications platform to advance clinical care, research, prevention, education, mental health, financial well-being, nutrition, fitness, and outreach to the Latino community. As the first-ever preventive care online educational platform targeted to U.S. Hispanics, the aim is to guide Hispanics to live healthier lives and to ensure preventive care engagement and accountability by changing the conversation about health from illness to wellness and providing solutions‏. At CHL Marketing Lab we offer a full-scale comprehensive tailored approach to ensuring that organizations and/or corporations reach Hispanics whether it be patients, consumers, or the community. We create, develop, and implement internal and external campaigns to help organizations connect the dots and reach their business objectives. For any questions or for more detailed information, please contact us.